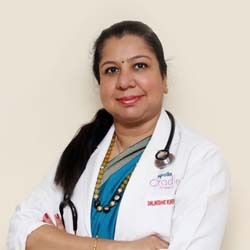 Dr Nidhi Khera is a Senior Consultant Obstetrician and Gynaecologist, Apollo Cradle with around 20 years of experience. MD (Obstetrics and Gynaecology) from Maulana Azad Medical College, New Delhi. She furthered her professional qualifications with DNB (Diplomate National Board) from the National Board of Examinations. She then went on to complete her Senior Residency also at Maulana Azad Medical College and Lok Nayak Hospital for three years. During her training she has worked with prominent and senior gynaecologists of Delhi (Dr Swaraj Batra , Dr Raksha Arora, Dr Reva Tripathi, Dr Ashok Kumar). In 2010 she went to St George’s Hospital, London, U.K. for training in maternal-fetal medicine under Prof. B.Thilanganathan. There she learnt the finer nuances of understanding and dealing with high risk pregnancies from Prof. Thilanganathan , Dr Amarnath Bhide. Striving hard to give successful outcomes in high risk pregnancies is a passion for her. Pursuing her interest in laparoscopic surgeries , she was awarded Fellowship of International college of laparoscopic surgeons (FCLS) In 2012. She also has to her credit Sir Ganga Ram Fellowship in “Minimal access surgery” under Dr. Pradeep Chowbey (2006 ). She is an active member of AOGD, FOGSI, SFM, IMS – various associations of her gynaecologist fraternity . I delivered my baby at Apollo Cradle under the care of Dr. Nidhi Khera. She had extended her care and support till her best possible. I really enjoyed the ambience and decoration in the deluxe room where I stayed. Special thanks to housekeeping services. I am overwhelmed with joy. I had a safe delivery all the credits to Apollo Credit and my Dr. Nidhi Khera. My special thanks to the housekeeping service for keeping my room neat and clean. A highly recommended place for the getting great pregnancy care. The best place for joyful birthing experience is Apollo Cradle. I loved the welcoming place and pleasant decorations. My doctor was Nidhi Khera who gave the best care. My family and I are very thankful to all the team for giving us the best experience. Under Dr Nidhi Khera, I had my delivery at the Apollo Cradle. The entire staff is really good. The care manager is very helpful. The food here is clean as well as good in taste. Thanks to the Apollo Cradle team for giving us our bundle of joy. I was under observation at the Apollo Cradle under the care of Dr Nidhi Khera. She is an incredibly talented woman who handled my treatment with care. The whole process was made very comfortable, thanks to the amazing staff at the hospital. I visited the Apollo Cradle for my delivery. The doctor in charge was Dr Nidhi Khera. She is caring and very good at her job. The care manager is very sweet and helpful. The nursing staff is amazing and looks after you well. I had my delivery at the Apollo Cradle under Dr Nidhi Khera. The entire staff was great. We selected a Deluxe sharing room which was well maintained by the housekeeping staff. I would recommend Apollo Cradle to all my friends and family. I chose Apollo Cradle for my delivery. The doctor in charge was Dr Nidhi Khera. She was very approachable to talk to and made the whole process very comfortable. The staff is great and is very helpful. The rooms were also properly maintained. I would surely recommend Apollo Cradle to my family and friends. I had my delivery at the Apollo Cradle. The doctor in charge was Dr Nidhi Khera. The front office team was very helpful. The doctor and the nursing staff were great and attended to all my needs. Thank you, Apollo Cradle. I had a wonderful experience. I went to Apollo Cradle for my delivery. The doctor in charge was Dr Nidhi Khera. She was very caring and supportive during the whole process. The whole stay was very comfortable, thanks to the nursing and the housekeeping staff. Thank you Apollo Cradle & the entire team for giving us a feel good vibe in your centre. All the staff members are cooperative and disciplined, and the doctors and nurses are highly professional. My stay here was very pleasant and memorable, and I would particularly like to thank the night staff nurse, Sijo, who was really affectionate. Overall, it was a lovely experience for me and my family. My stay was pleasant, and I\’m happy that my doctor was Dr. Nidhi Khera. She took very good care of us. The staff in the hospital too was very supportive and efficient, be it the front desk staff, housekeeping or nurses. Thank you to everyone in the centre. The excellent care during my stay & birth made my experience exceptionally good. The nursing department of Apollo Cradle is so co-operative. The overall experience made our stay truly memorable. The experience overall has been amazing. The doctors, nurses and the entire staff has been very helpful and caring. Every single person we met has been kind and caring. Thanks a lot for all the love and care you people at Apollo Cradle extended. It made our experience towards our new life a very joyful and hassle free one. Lots of good wishes to the staff; it\\\’s the most helpful I have ever met. The experience at Apollo Cradle has been amazing. The entire staff is very caring. The services and efficiency are excellent. Thanks everyone, including Dr. Archana Dhawan, for taking care of me and my baby. The doctors, nurses, and all the support staff here are absolutely excellent. They took a lot of effort to make my stay here comfortable. Special thanks to my doctor, Seema Thareja, and a big thank you to everyone else. Apollo Cradle has excellent hospitality, and everyone, from the doctors, nurses to the support staff are very cooperative. I truly loved my experience here, and I\’m glad we had Dr. Nidhi Khera as our doctor. Thank you to everyone at Apollo Cradle. We got admitted in Apollo Cradle for the second time in the same centre and everything was just as good as last time. We have only wonderful things to say about the hospital, the service, the staff, and last but not the least, all the doctors. In India, since the medieval times, maternity requirements have not been of any importance. Eventually, the scenario developed and things turned around. Apollo Cradle gave us the best possible facilities and developed internal trust. We as parents experienced our life’s most beautiful time in the best environment. Our hearty thanks to the team of Apollo Cradle for giving us support and the chance to be lively again. A special thanks to Dr. Nidhi Khera. Thank God, Jai Mata Di, for blessing me, my wife, my family, and all my near and dear ones with a baby boy (after my sweet daughter). Special thanks to Dr. Nidhi Khera and the entire staff of Apollo Cradle for being so caring, kind, helpful and soft spoken. I will definitely refer or suggest Apollo Cradle to all my friends. In closing I\\\’d like to say, UPAR GHAR BHAGWAN TO NEECHE APOLLO CRADLE.